Some details and pictures have leaked in Gizmodo. Amazon has a reader. Sony has a reader and soon Barnes and Noble will have their own. The B&N device seems to overcome the shortcomings of the other two such as the inability to read under bright light and the difficulties of extended reading on a screen even though it’s been designed to look like paper. This device seems like it will put up a good fight with the other two. Add to the fact that B&N has retail stores out there far more than Sony Style stores to sell these readers to the masses. Now if only everyone could agree on a common format so we can buy books from anywhere we want or even support any files we put into it, then that would be an eBook dream. It’s still quite far away for me to think of giving up my dead tree books. But with all the competition heating up someone is bound to listen to the masses and finally bring out the reader that we all could live with. In case you haven’t heard, the Kindle will dropping prices to $259 and will now be available to international customers for purchase on October 19. Or is it really international? Logging into the Amazon website will greet you with a special message from Jeff Bezos announcing the price reduction of the Kindle from $299 to $259 and the introduction of an international edition for $279. I was so excited about the announcement and checked about the availability of the device in my part of the world and I came upon this. I wonder why they couldn’t price the device the same. Then I remembered that Sprint provides the US Whispernet coverage while AT & T will provide the international coverage. Technically the wireless capability of the two is vastly different from one another which results in the difference in price. I just wish they could source out both parts to be equally priced and offer it at the same price. I know it’s just twenty dollars but that’s a lot of money nowadays. Moving on, Amazon seems a bit vague about the capability and network coverage in my area in their “helpful” guide to the international Kindle. Assuming it’s still the same device as the current Kindle aside from the hardware of the whispernet, these devices are locked to specific carriers and not user servicable. Meaning if you do buy it for your region outside the US you cannot remove the AT & T sim card I’ll assume to place in your local provider. Which means the cost of sending the book over whispernet to you in an international location will cost the user an additional $1.99. Is the $1.99 worth it for the Kindle? Well it depends on how many books do you intend on buying? There’s the issue of sales tax, duties and whatnot that greedy governments like the Philippines charge. Yes they tax books here and there was this whole fight about it. It turned out that the tax exemption for books only applied to the large bookstores and not the individual buyer of let’s say Amazon. To top it off, they will make you go through the arduous of filling out the forms and sending the forms to the appropriate government instutution just to get you tax refund. So yes, in my opinion the $1.99 is worth paying just to avoid the troubles when claiming your books, you’ll have the instant gratification of having the book in minutes from almost anywhere, and to keep the government paws off your hard earned money when buying books that you want. I love what the Kindle offers and I’m currently enjoying that through my iPod via the Kindle app from the iTunes App Store. I currently have five books on it and it has served me well. Sure the screen is a bit tiny for reading but it does the job for me at the moment. Will I get the Kindle? Yes. But not until the price goes to $199 for the international edition. 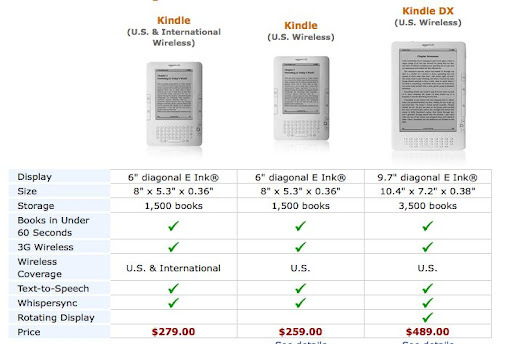 I think that is the sweet spot for many in buying the Kindle. Unless everyone is waiting for Apple to jump into the fray with their own tablet next year, then that’s something else entirely. If you hurry now you can get the Kindle at $359.00 with free two day shipping. It looks like it’s not moing as fast as they want it to be or the economic slowdown has hit them or they kindle is selling fast enough that their manufacturing costs are now down and they are getting it for less and passing it off to the consumer. Very tempting. Sadly though it only works in the United States. I’m looking forward to getting this when the prices go down and when the service is available worldwide. They way it should be. Amazon’s “revolutionary” e-book reader is finally in stock in Amazon’s store but will the masses catch on? It’s not the first time that someone has tried to make a leap from the printed word to the digital print. Sony has their own reader which has been around for a while now. But Barnes and Noble and Borders are still around so I guess people still like carrying around books. Could it be the price? At $400 plus the cost of the books, it seems pretty steep for the average book reader. But for the techie and frequent traveler then this may be the product for them. Could it be the network limitation? 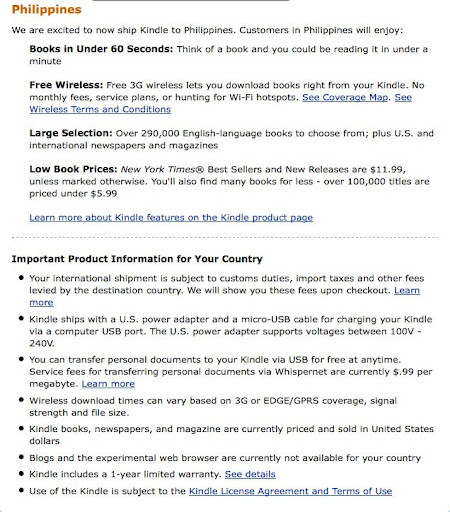 The Kindle connects to Amazon.com’s page via EVDO, basically the current cellular phone network and browse wikipedia and blogs as well as buy and download the books that you want off the store and trasmitted directly into your Kindle. So it’s currently in North America only. I don’t personally know anyone who owns one nor have I seen one in the wild. I do think that this product is quite advanced and book readers will take a little getting used to idea that what used to be a 300 page bestselling novel in their hands is now just 10 oz. Would $400 justify people dropping their $5.99 books away for my carry-on luggage to be a little lighter? Maybe when the service is more widely available outside the U.S. and the price drops to the magic $100. I’d probably get it. But for $400, I could get myself a PS3.